30 February / March 2015 Elearning! career destination committed to ofering our employees every opportunity to realize their professional goals [at Scripps]. If we do it right, there's no need for employees to leave the organization. We take pride in providing an environment where our employees can enjoy a supportive, collaborative workplace with a united vision." To that end, Scripps Health is making every attempt to stay ahead of the talent curve. Its talent management team works to be proactive in hiring, developing and supporting employ- ees to create the best opportunities for both them and the organization. It all starts with the hiring process. "We strive to hire candidates with characteristics closely aligned with our values of quality, respect and efciency," notes Kienast. "As part of our career destination philosophy, we've developed several innovative hiring and retention practices. We seek to hire top talent and then develop their skills and knowledge to do the following: provide quality clinical care and service; innovate new services and care models; and lead and manage change." To attract potential candidates, Scripps uses social media, Web campaigns, search engine marketing and optimization, and more. On a more traditional level, it sends recruiting representatives to campus ca- reer and other of-site events. It also has a robust employee referral program. Ten, "we use a variety of analyti- cal and online tools to assess candidates and talent for the best organizational ft," Kienast notes. 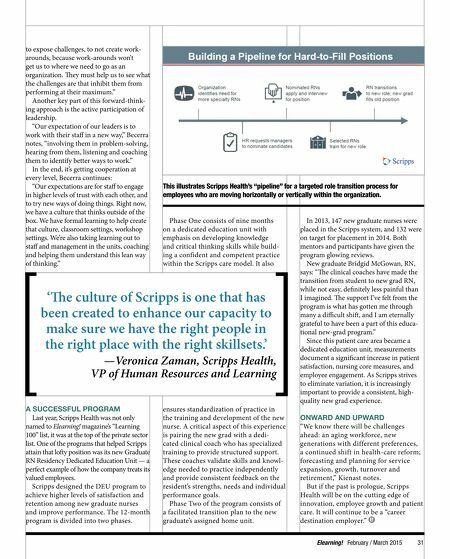 Scripps provides education, training and development programs to help employees and the organization stay competitive and successful: "We work with our talent managers on how to identify and grow talent within their depts. Our talent management team meets with employees to promote growth opportunities and assist them in discovering educational or fnancial resources that they would need to succeed in career development." Because Scripps is so large, there are plenty of chances for any employee to move either horizontally or vertically within the organization. Tat gives them a chance to take on new projects, new responsibilities and new challenges. "Te [internal] pipeline process was very well thought-out," says Zaman. "It's built on a prescriptive process. We use the same assessment tools and the same criteria that we use when we hire. It's not so much about the skills. It's really about making sure people have those characteristics that make them a strong team player." STARTING AT THE TOP "Heading us in this journey is Chris Van Gorder, our president and CEO, who's a key member of our team," Zaman continues. "At a time when health care is feeling the tighten- ing reins of the reform and reimbursement that is diminishing, we have at our helm a leader with his passion for learning. One of Van Gorder's strengths is that, every day, he asks himself and he charges every employee to ask the question: "Did I make [our founders] proud today of what I've done?" When Van Gorder became president, Scripps had a frst-year turnover rate of 30 percent. In other words, a revolving door. Morale was at its lowest point ever, but his commitment to his employees and his focus on learning helped turn everything around. "At a time when health care is feeling the tightening reins of the reform and reimbursement that is diminishing, we have at our helm a leader with his passion for learning," notes Zaman. "He is hands-on, at the front line, with our patients, and a big piece of our success is the collaboration among Chris and all our team members." 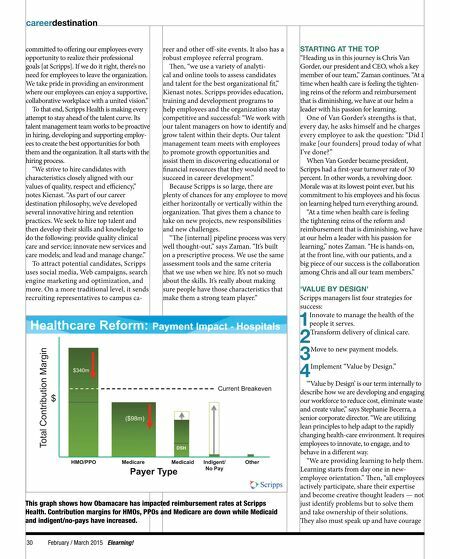 'VALUE BY DESIGN' Scripps managers list four strategies for success: 1 Innovate to manage the health of the people it serves. 2 Transform delivery of clinical care. 3 Move to new payment models. 4 Implement "Value by Design." "'Value by Design' is our term internally to describe how we are developing and engaging our workforce to reduce cost, eliminate waste and create value," says Stephanie Becerra, a senior corporate director. "We are utilizing lean principles to help adapt to the rapidly changing health-care environment. It requires employees to innovate, to engage, and to behave in a diferent way. "We are providing learning to help them. Learning starts from day one in new- employee orientation." Ten, "all employees actively participate, share their expertise and become creative thought leaders — not just identify problems but to solve them and take ownership of their solutions. Tey also must speak up and have courage This graph shows how Obamacare has impacted reimbursement rates at Scripps Health. Contribution margins for HMOs, PPOs and Medicare are down while Medicaid and indigent/no-pays have increased.